Explore the religious side of Myanmar on this fascinating 2-day shore excursion in Yangon and Bagan. 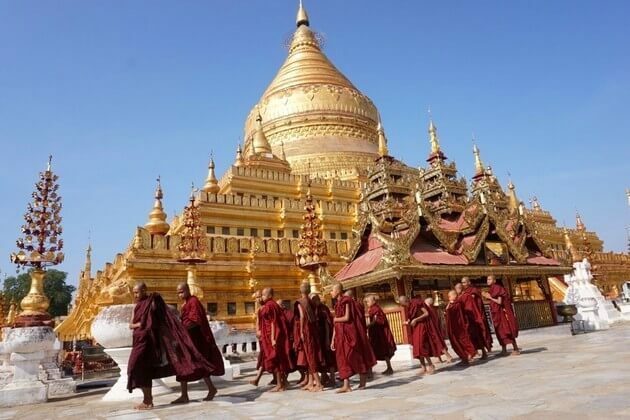 Visit prominent sacred sites including Chauk Htat Gyi and Shwedagon Pagoda in Yangon as well as Shwezigon Pagoda, KU Byanuk Gyi Temple, Khay Min Ga Temple, Ananda Temple, Mingala Zedi Pagoda in Bagan. Delve into its historic colonial past at the National Museum and Downtown Yangon where major British architectural monuments are found. Upon pickup from Thiwala port, meet your private driver and guide who’ll take you 25km northward to Yangon. Start the trip at Chaukhtatgyi Paya (or Chauk Htat Gyi Buddha) Pagoda, which houses a magnificent 65m-long reclining Buddha donning a crown encrusted with diamonds and gems. Next, visit the sacred Shwedagon Pagoda, located atop of a hill. Start from the foot of the hill, and follow your guide on a long entrance stairway to the main terrace, passing by various markets, worships, and monasteries. Learn about the daily life of local dwellers in the immediate vicinity and Burmese Buddhism as you visit the monks. If you don’t want to climb, elevators and escalators are also available. As you come up from the covered walkway, marvel at the glittering marbled main terrace, dotted with holy worship halls and pavilions. Take off your shoes before venturing deep inside to listen to your guide introducing Myanmar spiritual beliefs. Follow your guide downtown to discover British colonial buildings. Marvel at the old charms of magnificent colonial architecture as you stroll through the City Hall, Inland Water Transport Building, Custom House, and the Stand Hotel – one of Southeast Asia’s historic colonial hotels. 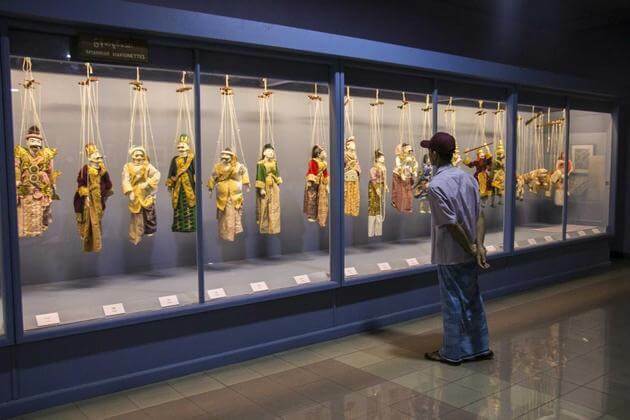 After lunch in a local restaurant, travel northwest to visit National Museum. Its main treasure – the impressive gem-encrusted Lion Throne that belonged to the last king of Myanmar – makes up for the inadequately labeled and lit exhibitions. See the ostentatious lifestyle of the old kings as you stroll through the display of lavish beds, gold rugs, ivory kitchen chairs, and embellished ceremonial attires. 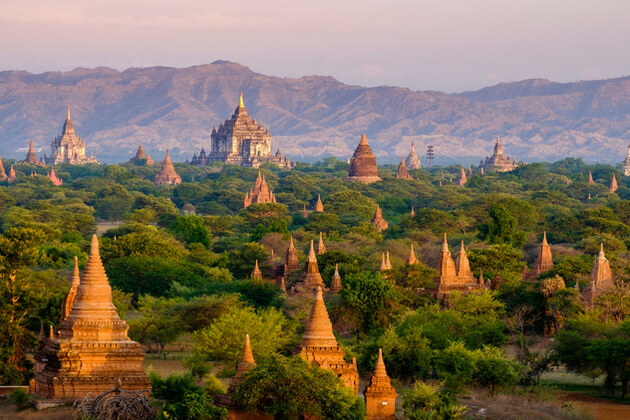 End the day trip with a 1-hour flight to Bagan. Overnight in Bagan. 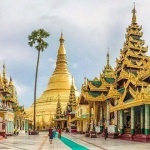 In the morning, start your trip with a hotel pickup followed by a visit to Shwezigon Pagoda where you’ll learn about Burmese spirit worship, besides from Burmese Buddhism which you have learned on the previous day. 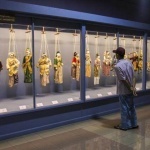 Venture inside to see 37 figures of pre-Buddhist nat (spirit), which were officially institutionalized by Bamar monarchy. Next, head to GU Byauk Gyi temple, which features spectacular murals of Jakarta scenes. Continue on to Khay Min Ga Temples to enjoy breathtaking panoramic views of numerous surrounding monuments. Next up is Ananda Temple. A masterpiece in the incorporation of Myanmar and India architectural styles, the temple houses four standing Buddhas, each facing a distinct direction. Continue on to Mingala Zedi Paya (or Blessing Stupa), which is built in a huge bell-like dome structure. After lunch in a local restaurant, visit Bagan House Artistic Lacquerware factory to observe artisans working on different stages of lacquer making and see a nice collection of good quality lacquerware. Afterward, board your plane back to Yangon. Trip ends. Yangon the former city of Myanmar (Burma) was a fascinating city to discover. We did a private Yangon tour for 6 which was amazing. Our guide was excellent. He introduced the city and local culture to us with his incredible knowledge, he spoke very good English and was able to modify the tour to fit our interests. We toured the center of Yangon to visit several iconic pagodas and the old British colonial buildings. We spent an hour in the Market of Bogyoke (Scotts). The highlight of the tour was the magnificent Shwedagon Pagoda. We saw the pagoda in the late afternoon and early evening, it was fantastic. The excursion is really worthwhile! It opened up to the western travelers in the past few years. Thanks for your feedback. 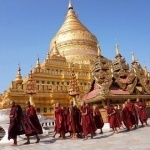 We are pleased to be your choice on Yangon shore excursion. Hope you will enjoy more trip with us. Is it possible to do a shore excursion to Yangon and Bagan from Thilawa and include an early morning balloon flight over Bagan? We will be on the Volendam and arrive December 26. What is the cost of this tour and does it include airfare? Thank you. Thanks for letting us know your travel plan, we have dropped you the full customized itinerary for your shore excursions in Yangon & Bagan, Myanmar. Please check your email and feel free to contact us if you have any question. Is it possible to do a two day shore excursion to Yangon and Bagan from Thilawa and include an early morning balloon flight over Bagan? We will be on the Volendam and arrive Feb. 21. How much is the price for 2, 4, … 10? Thank you for reaching to us. Please check your email for detailed quotation of Yangon shore trip. Feel free to ask us any question you may have. We would be interested in combining Yangon (day 1) with Mandelay (day2) returning to our cruise ship. Is this possible?? Thank you for letting us know your travel plan. The detailed quotation of Yangon and Mandelay shore excursions has been sent to your email address. Please check it and let me know if you have any other enquiries. What is the price of this 2 day tour? Thanks for your request on Yangon shore excursion, we have dropped you the detailed quotation, please check your email. Curious about pricing for 2 adults and 1 child for this trip, or if it’s possible to do Bagan as a day trip. We have about 3 days in Yangon in March 2018. Thank you for letting us know your travel plan. Please take a look at the detailed quotation and schedule of Bagan shore excursions which has already been sent to your email address. We will be on the Oceania Nautica, arriving in Thilawa @ 8am on April 18, 2018 and leaving Thilawa @ 1pm on April 20. We’re interested in your Yangon & Bagan tour — we assume Balloon Tour will no longer be available in April? Please let us know about availability and price for 2. Thanks. Thank you for your request. Please check your email for detailed quotation of Yangon and Bagan shore excursion. Feel free to contact us should you have other enquiries. Please check the detailed itinerary and quotation for this Yangon & Bagan shore excursion that have been sent to your email address.